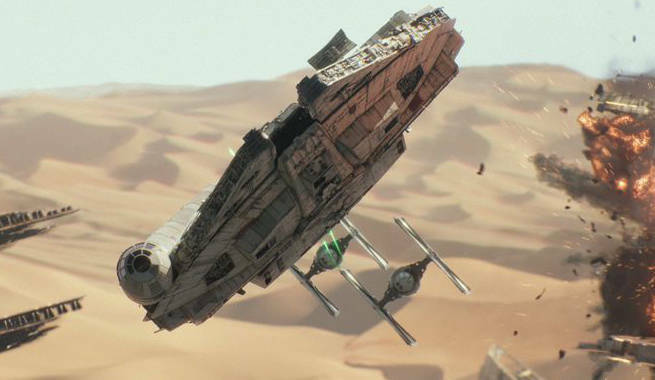 With Star Wars: The Force Awakens shattering box office records and a home video model that makes that of Disney's animated classics look posiitvely modest, Lucasfilm and Disney are reportedly looking for a TV suitor who's willing to pony up big bucks to be the first to air the new Star Wars movies. Variety reports that Disney is aiming for a $30 million payday on each of the next three Episode movies to hit the small screen, starting with The Force Awakens. No word yet on whether that means they're shopping the Star Wars Story films separately, although obviously if Rogue One makes a ton of money in 2016, that could change everybody's math a little. Turner, FX Networks, Viacom, NBCUniversal (focusing on USA and Syfy), A+E Networks and AMC are rumored to be among those bidding for the series -- and even the older movies have a pretty high asking price for vintage material, Variety's sources claim. They also note that a deal Disney recently struck with Netflix will see films released 2016 and later head to the streaming service on a fairly non-negotiable schedule -- something that might make networks less anxious to bid high on anything beyond The Force Awakens. Don't be surprised if these films end up at ABC or Freeform, either; Variety notes that while there's an obvious upside to that, not exploring the fair market value before dealing internally could make Disney vulnerable to claims that they're manipulating prices in their favor at the expense of profit participation partners. With a diligently-documented fair market value, Disney could insulate themselves from such claims.